Talk about sweating the small stuff. 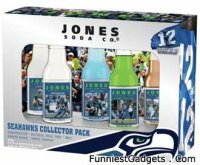 Jones Soda has come up with a tribute to the Seattle Seahawks football team with five flavors – Perspiration, Sports Cream, Dirt Soda, Natural Field Turf and Sweet Victory. Jones Soda created this Limited Edition Seahawks Collector Pack as a tribute to the Seattle Seahawks and a little taste of what it’s like to be in the NFL. If you can get through it all, only then can you taste SWEET VICTORY. Each pack will retail for $19.95. I don’t know about you, but my stomach is churning already.